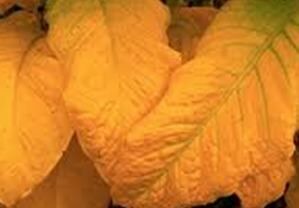 Brightleaf tobacco is commonly known as "Virginia tobacco", regardless of where in the world it is harvested. Prior to the American Civil War, most tobacco grown in the US was fire-cured dark-leaf. This type of tobacco was planted in fertile lowlands, used a robust variety of leaf, and was either fire cured or air cured. Sometime after the War of 1812, demand for a milder, lighter, more aromatic tobacco arose. Ohio, Pennsylvania and Maryland all innovated with milder varieties of the tobacco plant. Farmers around the country experimented with different curing processes. But the breakthrough did not come until around 1839. Growers had noticed that sandy, highland soil produced thinner, weaker plants. Captain Abisha Slade, of Caswell County, North Carolina had considerable infertile, sandy soil, and planted the new "gold-leaf" varieties on it. Slade owned a slave, Stephen, who around 1839 accidentally produced the first true bright tobacco. He used charcoal to restart a fire used to cure the crop. The surge of heat turned the leaves yellow. Using that discovery, Slade developed a system for producing bright tobacco, cultivated on poorer soils and using charcoal for heat-curing.Slade made many public appearances to share the bright-leaf process with other farmers. His success helped him build a brick house in Yanceyville, North Carolina, and at one time he had many servants..News spread through the area pretty quickly. The infertile sandy soil of the Appalachian piedmont was suddenly profitable, and people rapidly developed flue-curing techniques, a more efficient way of smoke-free curing. Farmers discovered that Bright leaf tobacco needs thin, starved soil, and those who could not grow other crops found that they could grow tobacco. Formerly unproductive farms reached 20–35 times their previous worth. By 1855, six Piedmont counties adjoining Virginia ruled the tobacco market.. By the outbreak of the Civil War, the town of Danville, Virginia had developed a bright-leaf market for the surrounding area in Caswell County, North Carolina and Pittsylvania County, Virginia.Danville was also the main railway head for Confederate soldiers going to the front. These brought bright tobacco with them from Danville to the lines, traded it with each other and Union soldiers, and developed quite a taste for it. At the end of the war, the soldiers went home and a national market had developed for the local crop. Caswell and Pittsylvania counties were the only two counties in the South that increased in total wealth after the war. One of the most famous English cigarette tobacco brands in the world, Three Castles, was a Virginia Brightleaf. In 1611 Rolfe, known as "an ardent smoker," decided to experiment with cultivating tobacco in Jamestown. 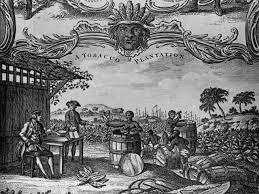 The plant had first been brought to England in 1565, perhaps from Florida by Sir John Hawkins, and by the 1610s there was a ready market in Britain for tobacco—especially Spanish tobacco from the West Indies. Rolfe obtained from a shipmaster some seeds from Trinidad and Caracas, Venezuela, and by July 1612 was growing Spanish tobacco, or Nicotiana tabacum—presumably at Jamestown, although the exact site of Rolfe's crop is unknown. The Virginia Indians also grew and smoked tobacco, so Rolfe could have bought seeds from them, but the native Nicotiana rustica, described by William Strachey as being "poore and weake, and of a byting tast," did not appeal to English smokers. Moreover, relations between the Indians and the English were unstable at best. Captain Robert Adams of the Elizabeth delivered samples of Rolfe's tobacco to England on July 20, 1613. Although Rolfe's early tobacco was considered by the English to be "excellent in quality," it still was not comparable to the Spanish product. Nevertheless, Rolfe believed that "no doubt but after a little more tryall and expense in the curing thereof, it will compare with the best in the West Indies." He was proved correct in 1617, when 20,000 pounds of Virginia tobacco were shipped to England, and in 1618, when that amount doubled. Rolfe's successful tobacco experiments inspired others to begin planting available land in Jamestown and in the settlements along the James River. General planting began first at West and Shirley Hundreds and moved east to Point Comfort along a 140-mile stretch of the river. In 1622, despite the Indian uprising that killed about 350 colonists and destroyed several plantations, the settlers' crop yielded 60,000 pounds. Later in the 1620s, the English took over cleared Indian land and spread tobacco cultivation even farther by using the headright system, in which planters paid to transport people across the Atlantic in exchange for fifty acres of land. The Accomac peninsula was put under cultivation by 1629, when a total of 2,000 acres of tobacco was being grown there. Around the same time, the wasteful practice of growing three or four crops of tobacco on the same field began to deplete the soil in and around Jamestown. The General Assembly passed a law in 1632 to reduce the number of tobacco plants that each settler could grow to 1,500, and thus the settlers began to seek virgin ground where they could grow even more tobacco on each field. By 1635, tobacco planting had moved away from Jamestown as settlers migrated to lands on the south side of the York River, and by 1648 the planters had received permission from Governor Sir William Berkeley to move north of the York River into the area that had become known as Northumberland. Settlers continued to move westward, away from exhausted Tidewater lands—reaching the Rappahannock and Potomac rivers by 1650, moving into Lancaster County, and then, by 1653, into what is now King William County. In 1689 the York River region produced the greatest amount of tobacco, followed by the Rappahannock River area, the Upper James region, and the Accomac peninsula. According to the historian Melvin Herndon, tobacco planting moved north of the fall line into the Piedmont region by 1720, and a decade later, it had been established in Spotsylvania and Goochland counties as well. Between 1750 and 1755 tobacco cultivation seems to have been centered in the Upper James River region, the York River region, and the Rappahannock River region, with each area exporting about 83,000 hogsheads (barrels filled with dried, pressed tobacco leaf) during this period, while the Lower James River shipped only about 10,000 hogsheads. In 1759, Elias and William Edmonds settled near what is now Warrenton in Fauquier County and began growing a popular brand of the crop that came to be known as Edmonium tobacco. Within ten years the county of Albemarle, including what are now Amherst and Nelson counties, as well as Cumberland, Culpeper, and Augusta counties, was producing great quantities of the Edmonium brand. Relatively cheap labor, a growing population of middling planters, the increasing worldwide demand for tobacco, and a system of regulation designed to maintain the quality of the product all contributed to the creation of a tobacco industry in Virginia, especially in the Piedmont area. When Virginians first began exporting tobacco, they relied on building personal relationships with English merchants to whom they sold their wares. This allowed planters to receive payment immediately instead of waiting for the tobacco to be sold in Europe. But as tobacco prices fell in the 1680s and 1690s and the market became less stable, it was more economical for planters to ship at their own risk to England, where a commission agent would, for a fee of 2.5 percent, store the tobacco, pay all duties and fees, sell it, and use the profits as his client directed. By 1730 approximately 40 percent of Chesapeake tobacco was being shipped by the consignment system. Merchants sent agents, or factors, to Virginia to liaise with the planters from whom they purchased tobacco. Factors operated from the small port towns on the Chesapeake Bay and the major rivers and opened stores, where they sold manufactured goods from Great Britain on credit. They also sent agents to buy tobacco directly from middling to small planters who could not afford the costs of consignment. The store system was dominated by enterprising young Scotsmen who had access to cheaper, faster shipping routes and whose operating costs were lower than those of their English counterparts. As a result, Scotland took over a large portion of the tobacco trade from London. In 1720, Scotland, Bristol, and Liverpool transported about 40 percent of the Chesapeake's tobacco. Because goods were bought with promissory notes that represented a certain amount of tobacco, quality control was vital to the industry's success. This issue had concerned Virginia's politicians since 1619, when the first inspection law was passed. The law ordered all low-quality tobacco brought to the Jamestown inspection site to be burned. The General Assembly amended the law in 1623 to allow for selected men in each settlement to condemn such tobacco. A 1630 law disallowed accepting inferior tobacco in payment of debts; anyone who did so lost his right to plant tobacco and could only recover it by petitioning the General Assembly. In 1633 five sites for the inspection of tobacco were named: Cheskiack, Denbigh, James City, Shirley Hundred Island, and Southampton River in Elizabeth City. By the end of that year two more sites had been chosen at Warrosquyoake and between Weyanoke and the falls of the James, but no warehouses were built there. An act of 1639 added 213 inspectors to be appointed, 3 in each district.